In this audiobook, you'll find, in context, everything Aristotle, Socrates, and Plato had to say and a great deal more, all simplified and explained. Basically, those famous Greek philosophers told us we were gods. I will explain how and why that's so and show you how to live your life as a god. As gods, we have the power to choose who we will be. 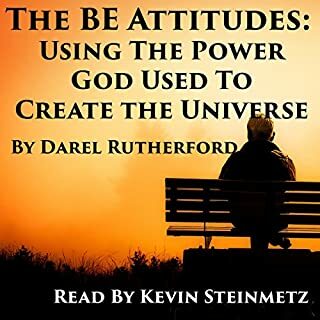 And lessons learned from this audiobook will have you using your god power, being power, to make yourself richer, healthier, happier, and wiser than you'e even imagined possible. Obstacles or opportunities... all depends on who we choose to be and the perspective from which we look to see, when facing challenges. You can be the victim or you can be the victor. Whatever role you chose to play in life directly affects how all of life responds. The life we have is like a mirror, reflecting back our choice of being. To change results, go to the source.. yourself. Our choice of being determines response and response determines outcomes. Make stepping stones out of stumbling blocks and turn excuses into reasons to succeed. It all depends on who you choose to be when being challenged. What you make of your life depends on your choice of being. BE the CAUSE of your life results. BE the ANSWER to life's question "Who are you?". So, Why Aren't You Rich? So, Why Aren't You Rich? will convince you that becoming rich is just a matter of simple choice. 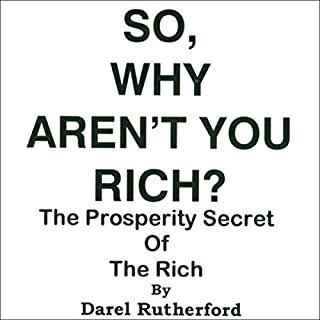 This audiobook will make you understand why you haven't chosen to be rich and show you how to remove that barrier. So, Why Aren't You Rich? picks up the process of thinking your way to riches where Think and Grow Rich left off. Now, you will understand why your thoughts can make you rich. Been waiting for Darel's books to come out on Audible. So thankful they finally have! We can get past our challenges if we imagine who we'd be if we already were, than act from that new perspective. Our new being choice becomes the cause for our upcoming results regardless of the past stories we've been telling ourselves. When we live and act from our new being choice, we let go of the obstacles which have held us back in our past and step firmly into a new reality perfectly in line with our new being choice. When we become the person we'd be if we didn't have excuses, we then gain the mindset needed to get past them. Our reality is a direct result of our being choice.